Contractors delivered it on April 30, while on Monday Bordeaux mayor Alain Juppé did the honour of opening the new stadium officially. Now the first great test is at hand: Girondings end their Ligue 1 campaign tomorrow and will face Montpellier at their new home, having bid farewell to the old one. A year before Euro 2016 it’s ready. Decision to build the stadium was made in association with Euro 2016, but that wasn’t the first time such subject had surfaced. By no means, Girondins and the city were well aware that the old Stade Chaban-Delmas was unfit. But none of the previous plans managed to get done, so UEFA’s event became the catalyst. To minimize financial repercussions, the stadium was contracted in public-private partnership mode, very common in France. It was awarded to Vinci-Fayat joint venture in 2012. Besides building the stadium, contractors were also entitled to run it for 30 years. Complete cost was a very disciplined one, beginning and eventually ending at €183 million ($204m) despite tendency of such projects to see price inflations. Numerous entities took part in the financing plan. On behalf of the taxpayers those were the federal budget of France (€28m), the Aquitaine region (€15m), agglomeration of Bordeaux (€15m) and the municipality (€17m). On the site first works began in late 2012, but official cornerstone mounting took place in April 2013. Since then it took exactly 2 years to deliver, the building was handed over as planned on April 30, 2015. Architecturally it’s an absolutely unique work by the Swiss team of Hearzog & de Meuron. Despite thousands of ideas already being in use worldwide, they still managed to create a stadium unlike any other. Would this become a trend-setter like Allianz Arena by the same designers? Doubtful, but that might be for the best, let others come up with something new. Planned for a location like this (flat, unoccupied, with woodlands around), the stadium is at the same time monumental and seemingly light. Beginning with a vast plinth with stairs leading to the main concourse around stands, the stadium then changes form into a reversed frustum growing impressively over spectators’ heads as they enter. The outer form is supported by hundreds of slender columns, almost mimicking the nearby trees. Two rings in a ‘rectangular’ mode – hardly a novelty in stadiums of 40,000. However, the seating layout isn’t just traditional. It’s optimally calculated for football field dimensions and offer retractable lowermost rows behind each goal to accommodate the longer rugby field. There are 60 skyboxes distributed equally between east and west stands, all located in the lower ring of seating. This is also where all hospitality areas are, totaling at 9,000 square meters (4,000 of which five an overview of the field to guests). When empty the stadium seems almost sterile. Even the roof’s inner structure is covered with white mesh to avoid distractions during games. It’s the people who are expected to create atmosphere, the stadium is only a well-conceived environment with acoustics and sightlines taken into account. As is the case with most central (largest) stadiums in French cities, initially the stadium was referred to as Grand Stade de Bordeaux. Then, in a more refined form it was called Stade Bordeaux-Atlantique due to the Ocean’s proximity. 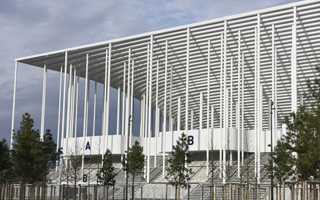 But for now the official name is simply Nouveau Stade de Bordeaux or “New Stadium of Bordeaux”. It’s certain to change further, but on one condition only: naming rights deal. No agreement has been reached yet, but the stadium is estimated to be worth just under €4 million annually, should a partner be found. Still, naming rights is very young in France and the market tends to verify expectations.